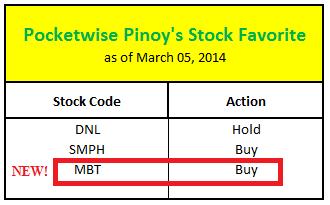 As one of the companies I am investing in, Pocketwise Pinoy features Metropolitan Bank and Trust Company as part of our Stock Favorite. Popularly known as Metrobank, let's talk about the background of the company and some stock market details. Metrobank has also been steadily expanding internationally. In the late 1990s, Metrobank opened branches and offices in London, Taichung, Tokyo, and Seoul. Metrobank was the first to be granted a banking license by the Japanese Ministry of Finance. It was also the first Philippine bank in Korea. In 2001, Metrobank became the first Philippine bank in China when it opened its branch in Shanghai. In 2010, Metrobank inaugurated its wholly-owned subsidiary, Metropolitan Bank (China) Limited, the first foreign bank headquarters to be established in Nanjing. The new bank serves as the base for Metrobank’s operations in China, with three branches located in Nanjing and Shanghai. First Metro Investment Corporation; Metropolitan Bank (China) Ltd.; Philippine Savings Bank; Metrobank Card Corporation; ORIX METRO Leasing and Finance Corporation; Metropolitan Bank (Bahamas) Limited; First Metro International Investment Company Limited; Metro Remittance (Hong Kong)Limited; Metro Remittance (Singapore) Pte. Ltd.; Metro Remittance (USA), Inc.; MetroRemittance (Spain), S.A.; Metro Remittance (Italia), S.p.A..; Metro Remittance (UK)Limited; and Metro Remittance Center Inc.
To buy shares of Metrobank, just look for the stock code MBT. Board Lot identifies the minimum number of shares that can be bought. It also indicates the increment of share amount that is allowed. This means that an investor is only allowed to post a buy order for a minimum of 10 shares. If the investor has more funds, he or she can buy more than 10 shares with an increment of 10 shares as well. So this will be 20, 30, 40, and so on. The system will not allow the investor to put in 15 shares or 22 shares in the buy or sell order in the main board lot. Fluctuation indicates the buying or selling price to be in multiples of 0.05 pesos. The investor can post 50.5000, 50.5500 but not 60.5100. The floor price dictates the minimum amount that the buyer can put as a buying price or the seller in the selling price. The system does not allow the user to put amount lower than 40.15 Php. The ceiling price dictates the maximum amount that the buyer can put as a buying price or the seller in the selling price. The system does not allow the user to put amount higher than 120.4 Php. Foreign investors are allowed to purchase shares of MBT. With the current price of MBT, it is still cheaper than the fair value. As a long term investor, this stock is still flagged to have a BUY rating as per COL Financial and Truly Rich Club. From the Market Price History table taken from COL Financial's site, MBT's value in 2009, 2010, 2011, and 2012 were 33.71, 55.38, 52.27 and 78.46, respectively. It can be observed that as time passes, market price for MBT goes higher. 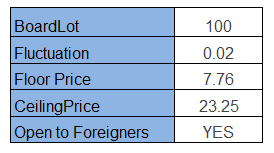 Based from the past data, we are expecting that in this year, MBT's price will be higher. For long term investors, let's accumulate shares from this company while it's still in our BUY state! So let's welcome our new addition to our Stock Favorite - MBT! Of course, we also would like to note that our recommended action for DNL has changed from Buy to Hold Ratings. Visit our updated table in the side bar for future updates.